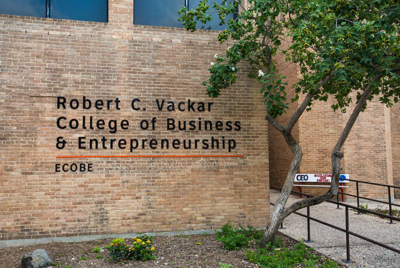 A new online Master of Accountancy program is now an offering in UTRGV’s Accelerated Online Graduate Programs in the Robert C. Vackar College of Business & Entrepreneurship. The MACC program is for accounting professionals seeking skills and knowledge to advance into a leadership role. It also enables students to satisfy the 150-hour requirement of the Texas State Board of Public Accountancy to sit for the Certified Public Accountant examination. “The online accelerated MACC program offers students the same courses, degree plan and instructors as does our face-to-face program, but allows for a flexible entry enrollment five times a year with courses lasting seven weeks each,” says Penny Simpson, interim director for the UTRGV School of Accountancy. The online MACC is one of few master’s in accountancy programs in the nation to offer courses in the accelerated format. It also follows Quality Matters certification guidelines. More information may be requested online or by emailing MACC@utrgv.edu.